Nestled in the Western Ghats, Coorg also known as Kodagu is located at an altitude of 1525 meters. Coorg lies in the Indian state of Karnataka and it is also believed that the origin of River Cauvery is from this region. The hills covered with mist, the numerous streams of water gurgling down in form of beautiful waterfalls and the wooded slopes covered with coffee plantations is what makes up most of the Coorg. Apart from being the largest producer of coffee in India, Coorg also produces spices like cardamom, pepper, turmeric and nutmeg amongst others. The undulating air mixed with the aroma of coffee and spices is what makes Coorg a heaven. Being a picture perfect destination, Coorg attracts a lot of weekend tourists and bag-packers. 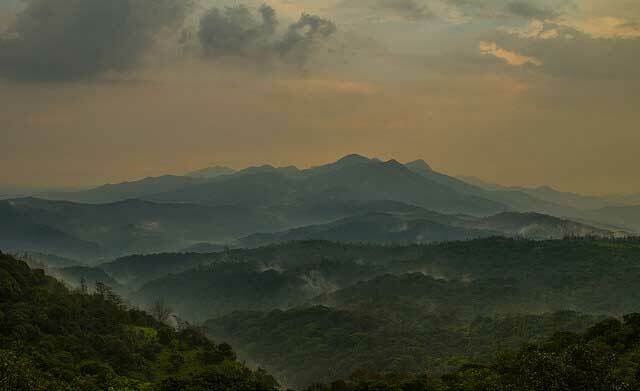 The trails of the Western Ghats that lead to confounding sites make Coorg a trekker’s utopia. Consisting of quaint rivers and pretty hamlets, Coorg has a beautifying topography. Dotted with temples and waterfalls amid the reclining tea and coffee plantations, Coorg is also home to some adventure sports like angling, rock-climbing and white water rafting. Coorg’s beauty lies in its thick bamboo trees, beautiful paddy fields and acres of dense forests of sandalwood, teakwood and rosewood trees that sprawl over the region. Being situated at a high altitude, Coorg experiences a pleasant weather all year long. The winters hit a low temperature of 11°C and last from December to February whereas the temperature shoots up to 34 °C in summers lasting from March to mid-June. The weather is favourable all-round the year to visit this rejuvenating hill-town. Coorg also receives an ample amount of rainfall during the monsoon months lasting from July to September. Coorg is one of the highest rainfall receiving places in the country. The best time to visit Coorg is from September to March. The weather is pleasant and ideal for long walks and enjoying the aromas in the air. The breeze carries a smoothing chill and makes the temperature just right to enjoy a vacation. The monsoon months should be avoided as Coorg receives a considerable amount of rainfall but at the same time the downpours make Coorg a heaven of lush green velvets and gushing waterfalls. Dotted with temples amid the serenity of nature, Coorg is full of religious places. The Omkareshwar temple being the famous temple of the region is one of the most visited places. Talakaveri is also believed to be the origin of River Cauvery is considered to be a sacred place and draws a lot of devotees round the year. Apart from the religious places Abby Falls and Iruppu Falls are nature’s lure. The gurgles of the water falling make the cascade a mesmerising sight. The sound of the water is like a soothing music playing in the backdrop while enjoying the hypnotising waterfalls. Coorg also has national parks and wildlife sanctuaries like Nagarhole National Park and Dubare, the elephant camps is another variation that the place offers. At the same time Coorg offers the activities that give adrenaline rush to the adventure junkies. Being at a high altitude the hill-town offers adventure sports like angling, rock-climbing, trekking and white water rafting. Coorg also has view-points like Raja’s Seat and Mandalpatti that offer stunning view of the Western Ghats richly laden with dense forests and tea and coffee plantations. For leisure one can stroll down the lanes of Coorg to enjoy the aromas of the plantations and witness the miracles of nature. Coorg is connected to nearby cities only by road. One can take a train to Mysore as it is the nearest city and then can drive to this gem of Karnataka. The public transports, though available, it is advised to hire a cab or a taxi or rent a vehicle and reach Coorg. Also while exploring Coorg it is good to have a private vehicle. There are Auto-rickshaws and private cabs to hire to explore the place locally. When in Coorg trekking and cycling are also good and salubrious options. Accommodations in Coorg are plenty. From high-end resorts and hotels to budget lodging, everything is available. Jungle Camps, Hotels, cottages and home stays are the options from which one can choose their lodging. It is advised to pre-book the accommodation if visiting during weekends or peak season.